The University of Glasgow is running a new free one-week Summer School this year, in partnership with the Sutton Trust. It will run from 7-12 July 2019 and is open to pupils who have just completed S5 and are continuing on to S6. It is a residential Summer School, with pupils living in University accommodation for the week. All meals will be provided and taken in University refectories and the Students’ Unions. Further details of the courses are below. 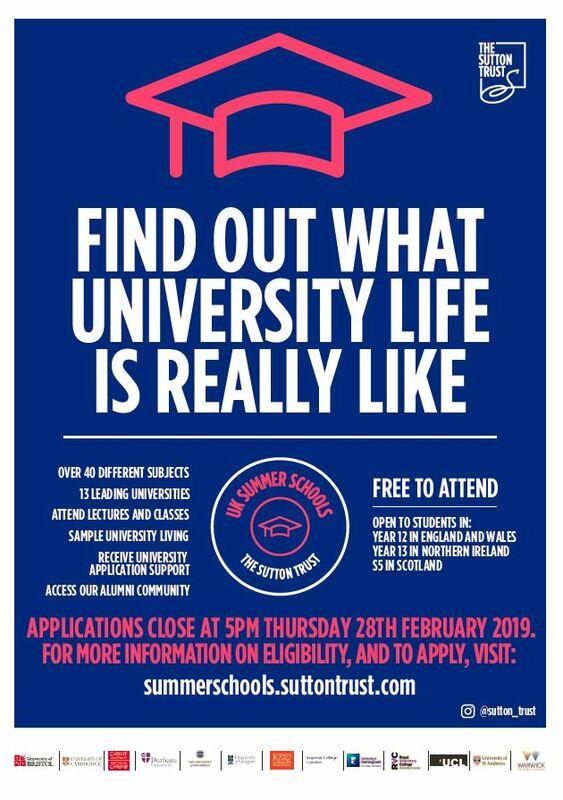 Pupils will meet existing undergraduate and postgraduate students and academic staff within their areas of interest, and attend workshops on: subject choice; applying to university; the UCAS system; student finance; student welfare and support, and academic and study skills. Evening activities will be organised such as: cinema evening; sporting and student club evenings; tours of Glasgow and the University campus. Pupils will also have the opportunity to complete our online Academic Skills module. Successful completion of the Sutton Trust Summer School and Academic Skills Module could lead to an adjusted offer of entry being made if a pupil subsequently applies to the University of Glasgow, as part of our contextualised admissions system of adjusted offers of entry for applicants from widening participation backgrounds. Applications are now open and will close at 5pm on Thursday 28 February. Pupils must apply via the Sutton Trust website at: summerschools.suttontrust.com . Pupils are not expected to meet all these criteria, but should indicate on their application, those they think are applicable to them. Regardless of the above criteria, priority will be given to pupils who have care experience or are estranged and living without family support. Pupils will also be asked to list a teacher as a reference – the teacher will be expected to verify the pupil meets some or all of the criteria listed.